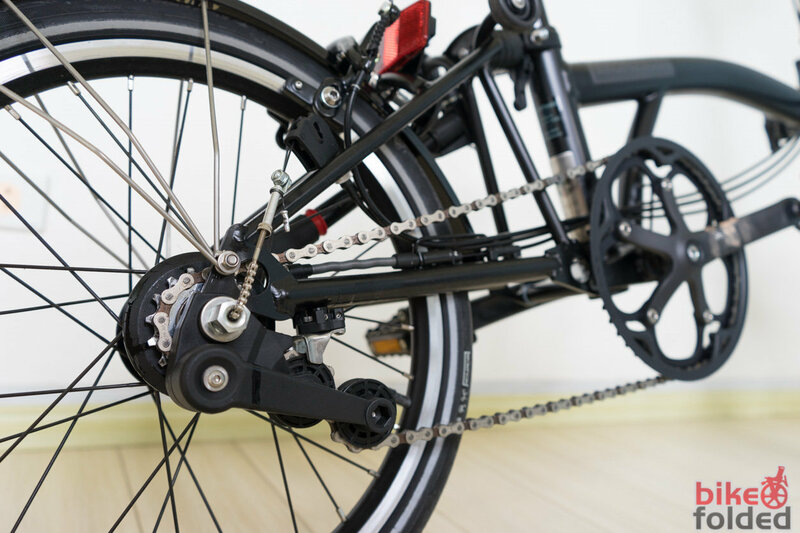 Brompton folding bikes come in 4 gearing options, including the single speed, 2 speeds, 3 speeds, and 6 speeds. Specifically, the standard single speed has 12T rear sprocket and 54T front chainring; the 2-speed version has 12T/16T rear sprocket and 54T front chainring; the 3-speed version has 13T rear sprocket and 50T front chainring; the 6-speed version has 13T/16T rear sprocket and 50T front chainring. Apart from the standard versions, the Bromptons are also available in reduced or raised gearing variations. So, you will have more choices to pick your suitable gear inches. You might want to choose a lowered gear to pedal easier or raised gear to go faster. Keep in mind that the gear range on a Brompton will feel a little different as compared to the range of road bikes. Now, let’s check out the gear inches and meters traveled (the distance the bicycle travels for one crank revolution) of all the Bromptons.